Ryan ryanghallHall made the most of the final Sunday of May. The Hamilton, Ontario native finished second in the PokerStarsSunday Warm-Up and banked $110,000 following a two-way chop. Hall fell to PokerStars member Boruzzein the finale of the $215 buy-in poker tournament, which attracted a field of 4,029 players. One month prior, Hall took down the PokerStars $55 rebuy for $41,000 and, back in February, he finished second in the Full Tilt Poker $100 rebuy for $34,000. Hall owns the 18th spot in the Sortable Rankings for Canada and sat down with PocketFives.com to recap his run. PocketFives.com: Thanks for joining us and congratulations on your rock solid Sunday showing in the Warm-Up. Boruzze and you each earned about $110,000 following the chop. Walk us through the event up until that point. Ryan Hall: The first big hand I remember was with three or four tables left. I was getting short and a short stack min-raised under the gun. I was terrified and had A-Q, so I had to get it in because I had about 12 or 13 big blinds. I got called behind by A-K and the short stack held K-K. I flopped a queen, rivered another queen, and in retrospect that was probably the nicest card I’ve ever seen. I won a couple of big hands at the final two tables and went into the final table with the chip lead. I won a couple of early hands at the final table and got a big chip lead. Then, I lost a pot where I was favored, lost a flip, and all of a sudden, I was right with the pack with five players left. Some things went right, though, and I got heads-up. PocketFives.com: Tell us about the poker scene in Hamilton. Ryan Hall: In Hamilton, there traditionally isn’t a lot. Scossett is a big player and a friend of mine. He plays the high-stakes heads-up and turbo sit and gos, so we hang out sometimes, but he recently moved to Toronto. There are some up-and-comers from Hamilton. Watch out for Dan shadyj10McGregor and Leroy Wong. PocketFives.com: Your largest online poker cash came in 2008, when you took down a $300 Cubed event during the Full Tilt Online Poker Series (FTOPS) for $159,000. What did that cash do for your career? Ryan Hall: That basically solidified me as an MTT player. I played a lot of sit and gos and that big cash made me realize how exciting and lucrative MTTs can be. I knew Russell rdcrsn Carson and he helped me make the transition and taught me quite a lot. After the switch to MTTs, I didn’t play many sit and gos anymore and now I’m exclusively an MTT player with the exception of some live cash games. PocketFives.com: Talk about the impact of Russell Carson on your game. Ryan Hall: He was an incredible help. As a sit and go player, I had some bad habits that needed to be taken out of my game to make the transition to MTTs and he transformed my game so I could be a winner. Since then, Eric sheets Haber has helped me a lot and I highly recommend PokerXFactor.com to anyone who wants to learn the game. 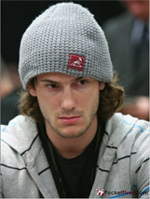 PocketFives.com: When will you be headed to Las Vegas for the World Series of Poker (WSOP)? Ryan Hall: I teach high school and the last day is June 30th, so I’m flying out there that night. I’m going to play the $1,000 event on July 1st, the $2,500 event on the 2nd, and the Main Event. After that, I’m definitely going to play EPT Tallinn and maybe EPT Portugal. Then, it’s back to work for me. PocketFives.com: How has it been juggling poker and teaching? We’d imagine that the early mornings are pretty rough. Ryan Hall: The early mornings are killer. It’s definitely the worst part of the job. Teaching takes a fair amount of work, though, and takes away from my poker. It’s actually really hard to balance the two and I wish I could spend more time on poker. I haven’t ruled out taking a leave for a year or two in the near future, however, to concentrate more on poker. The summer off is definitely perfect, though. I hope they never move the date of the WSOP Main Event! PocketFives.com: How did you get started in poker? Ryan Hall: I got into teaching before poker. I was a substitute teacher at first and wasn’t getting much work. In retrospect, I’m thankful for that because that’s when I took up poker. I would have never deposited my own money into online poker because I’m paranoid and careful with money. I played some play money tournaments on Paradise Poker and they offered me $2 free. I grinded it up playing $0.02/$0.04 Limit and never deposited my own money at any point. I just kept moving up in limits and working my way through the ranks using online forums to improve my game. Visit PokerStarsto sign up for this week’s running of the Sunday Warm-Up. He grinded the $0.02/$0.04 Limit tables and survived? One of the nicest and down to earth guys in the game…good job Ryan!